And just like the previous Metro Manila Film Festival, this year's MMFF Awards Night didn't end with no drama and so-called" scandal. With the disqualification of Honor Thy Father - a masterpiece of Erik Matti, it sure did some add juice to this year's selection and awarding ceremony. 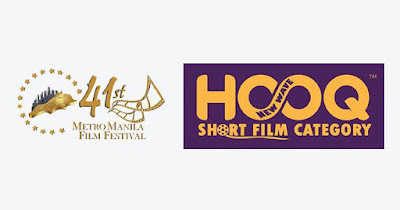 I bet that there'll be more news of MMFF 2015 in the coming days, but for now I'd like to share what it was like at the 41st Metro Manila Film Festival. It was my first time to actually witness an MMFF Awards Night. Though, I'm expecting a glamorous night, with the absence of some of the nominees (and winners) on the night's awarding ceremony, the whole event turned out to be a little boring. You can catch come of the New Wave entries on HOOQ. Just download the HOOQ app on your Adroid or iOS gadget, and signup to see these entries and some other local and foreign movies and TV series. Congratulations to all winner! Mabuhay ang Pelikulang Pilipino!